The activation of USP7 requires interaction between the CD and the C-terminal peptide (see Fig. 1a for domain definitions and nomenclature). The details of this interaction were described in a recent crystal structure (PDB: 5JTV) of Ubl45 and CD36. This structure clarifies how the activating C-terminal peptide binds, but the connection to Ubl45 was disordered, making it difficult to establish whether the C-terminus of USP7 binds into the activation cleft in cis or in trans. When we analysed the ability of USP7 to form dimers in size-exclusion chromatography with multi-angle laser light scattering detection (SEC-MALLS), we observed no dimerization for full-length (FL) USP7 (injected at 20 µM, peak elutes at ~4 µM) and only partially for the construct used in the crystallization experiment (injected at 45 µM, monomer peak elutes at ~7 µM) (Fig. 1b). This suggests that at the much lower concentration found in cells (~0.3 µM40), USP7 is more likely to exist as a monomer. We then checked what concentrations of Ubl45 are needed for in trans activation of CD (Fig. 1c). We find that in trans activation is possible, but only occurs at high concentrations, with an apparent KD of 110 µM (Fig. 1d). Consistently, a construct lacking the C-terminal tail (CD12345ΔC) can be activated by a catalytically dead FL USP7, (CD12345C223A) only at high concentrations, with an apparent KD of 60 µM (Fig. 1e). Both these apparent in trans activation constants are orders of magnitude higher than the concentrations (1–20 nM) that are sufficient for USP7 activity assays of full-length or CD-Ubl45 constructs31. We therefore conclude that, although trans activation of USP7 is possible at high concentrations, it cannot be the predominant mechanism of its self-activation. If USP7 acts as a monomer, this means that the interaction of CD and Ubl45 occurs in cis. The interaction of the C-terminal peptide with CD, as determined by Rougé et al. in the crystal structure36, is indisputable, but the positioning of the Ubl45 core did not seem as well-defined. We therefore wanted to investigate this interaction in solution. We used NMR spectroscopy to map the binding interface between CD and Ubl45 (Fig. 2, Supplementary methods). First we assigned the backbone resonances of Ubl45 (Supplementary Figure 1a) and performed prediction of secondary structure in solution. Since this matched the crystal structure (PDB: 5JTV, Supplementary Figure 1b), we concluded that the NMR conditions allow functional interaction analysis. We then analysed the interaction of Ubl45 with CD. We titrated the unlabelled CD (42 kDa) into isotope-labelled Ubl45 (25 kDa) up to a ratio of 1:10 and followed changes in peak position or intensity (Fig. 2a, b). Upon addition of CD, we observe only very minor chemical shift perturbations (CSPs) (Fig. 2b), but a marked decrease in intensity for residues in the core of the Ubl45 domains (Fig. 2c). The size of the decrease agrees well with the formation of a 67 kDa complex with affinity as determined by SPR (see below and Supplementary Figure 2a). Under these conditions, residues with large changes in their chemical environment upon binding are expected to show an even more dramatic intensity loss (Supplementary Figure 2b-c). From the absence of such effect for residues that are predicted to be in the interface based on the crystal structure (Fig. 2d) or for any other site on the core surface, we conclude that the Ubl45 core is not involved in a single, specific interaction with CD. Only a few, very minimal CSPs are observed, localized to C-terminal tail residues, with the strongest shift seen for Y1093 (Fig. 2b). The tail residues however remain sharp and intense peaks throughout the titration, indicating that the tail is not immobilized on the CD surface. This is surprising, since the tail is immobilised in the crystal structure, but this was solved in the presence of ubiquitin. Therefore, we wondered if ubiquitin could promote the binding of the tail. We generated a covalent complex with ubiquitin, as ubiquitin monomers bind poorly to USP7CD38, We used a suicide probe, ubiquitin-propargyl (Ub-PA41) to generate CDUb (Supplementary Figure 3a). In an NMR titration of CDUb into labelled Ubl45, we observed interaction only through a decrease in peak intensity, which was nearly directly proportional to the equivalents of CDUb added. At 30% of CDUb added, peak intensity for all Ubl45 residues, including the C-terminal residues, was reduced by ~30% (Fig. 2e). This indicates that Ubl45 forms a tight complex with CDUb. Now also the tail, and particularly the C-terminal residues are immobilized. Meanwhile we do not observe significant CSPs. This absence indicates that the free protein is in slow exchange with the complex (75 kDa) (see also Supplementary Figure 2b-c). 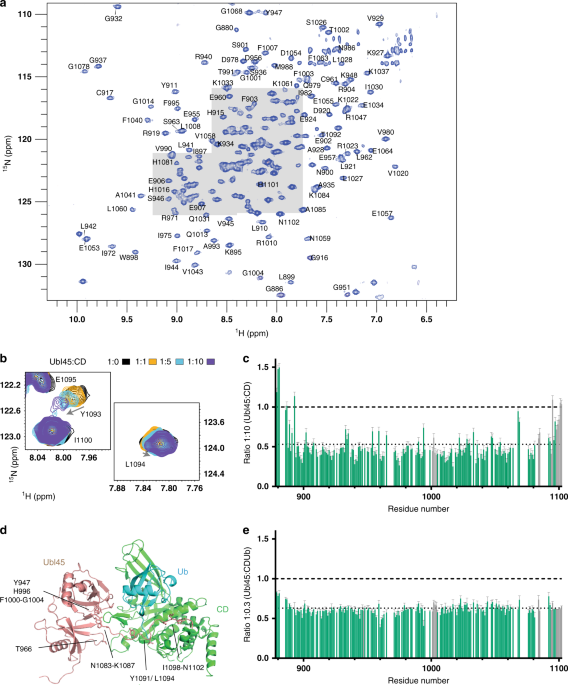 Together, these results suggest that while the Ubl45 binds to CD, it does so in multiple, weak binding modes predominantly involving the Ubl45 core to form a dynamic complex. Our data further suggest that the presence of ubiquitin or a ubiquitinated target can induce the specific binding mode of the C-terminal tail as observed in the crystal structure. For full activity the C-terminal tail is essential, but its affinity for the catalytic domain could only be measured indirectly. In surface plasmon resonance (SPR) experiments, interaction was not detectable31, but in an activation assay, the apparent KD-value was estimated at ~1000 µM36. This is one order of magnitude weaker than the apparent KD determined for Ubl45 (110 µM, Fig. 1d). Our NMR results also suggested that the Ubl domains contribute to the binding and activation of the catalytic domain. 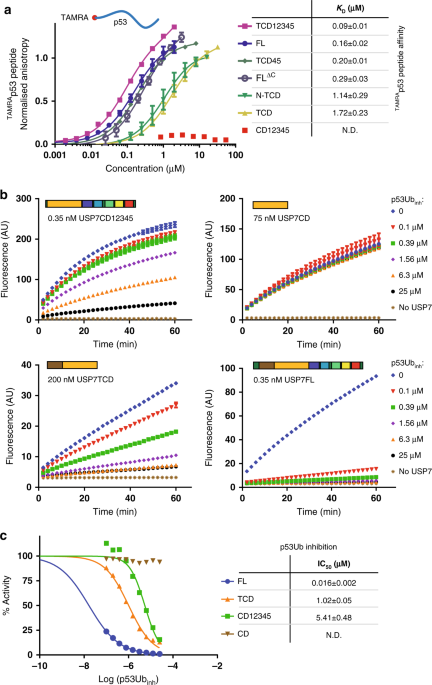 To investigate the interaction between Ubl45ΔC and the catalytic domain we immobilised GST-USP7CD on the SPR chip, flowing over the tailless construct Ubl45ΔC. We were able to detect binding at high concentrations. Extrapolation of the curve, suggests a KD of 420 µM (Fig. 3a), similar to that observed for the C-terminal peptide interaction in the activity assay. This suggests that both Ubl45ΔC and the tail bind weakly to the CD. We then tested the affinity of CD for Ubl45 including the tail, and get an approximate KD of 280 µM (Fig. 3a), comparable to the tailless construct. This suggests that the C-terminal tail is not the main driving force for the interaction between the CD and Ubl45 as the affinity is similar with or without the tail. This result is in agreement with the lack of binding between the C-terminal peptide and CD observed in the NMR experiment (Fig. 2c) and earlier data31, but seems at odds with the activating role of the tail in the activity assay. The NMR experiment seemed to suggest that ubiquitin needs to be present for immobilization of the tail on CD. To quantify the effect of ubiquitin on the binding of the activating C-terminal tail, we again used ubiquitin covalently coupled to the catalytic cysteine of the CD (CDUb). As CD on its own has low activity, the reaction between Ub-PA and CD had to be driven to completion using the trans activation of Ubl45. After incubation however, Ubl45 could not be separated from CDUb on gel filtration (Supplementary Figure 3a) requiring additional ion exchange chromatography. This indicates that complex formation between CDUb and Ubl45 is tighter than predicted, as a complex with a KD of 280 µM (Fig. 3a) generally dissociates during this type of gel filtration experiment. 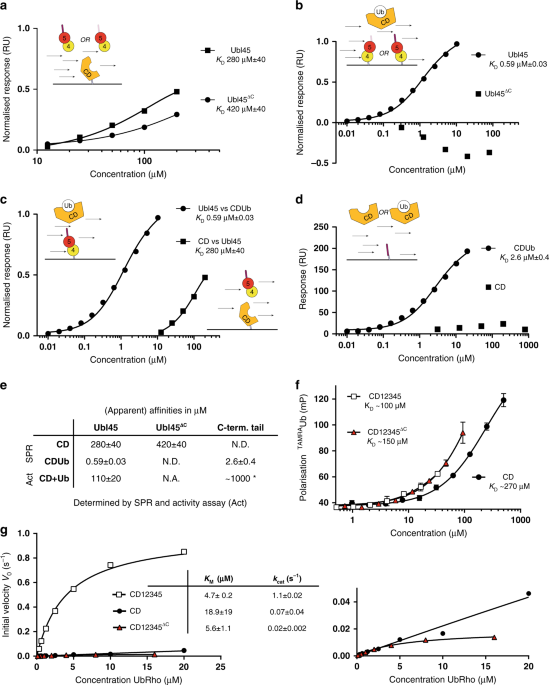 We quantified the interaction by SPR flowing CDUb over GST-immobilised Ubl45 (Fig. 3b). Data analysis in EvilFit42 identified a KD of 0.59 μM with a standard deviation of ±0.03 and a koff of 0.8 s−1 (Supplementary Figure 3b) for the interaction between CDUb and Ubl45. The presence of ubiquitin in CD therefore increased the affinity 400-fold compared to CD only (Fig. 3c). As the C-terminal tail is necessary for activation, we hypothesised that it would directly facilitate the interaction with the intermediate, ubiquitin-bound, state. To test this, we immobilised the tailless construct (Ubl45ΔC) in our SPR experiment setup and flowed over CDUb with concentrations up to 80 µM (Fig. 3b). 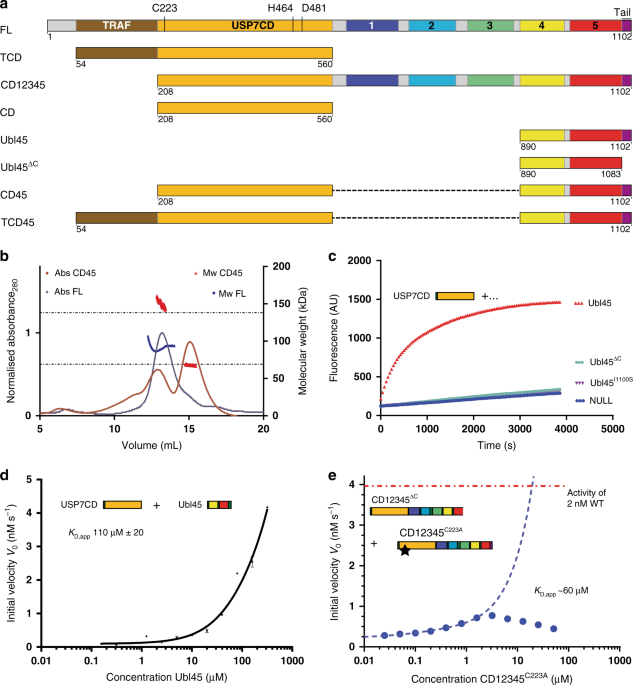 We could not detect any binding of Ubl45ΔC in this experiment, suggesting that the Ubl domains can no longer bind ubiquitin-bound catalytic domain, contrary to apo CD (Fig. 3a). This would mean that, after ubiquitin binding, the increased activity depends exclusively on the C-terminal tail. In agreement to this, the immobilised tail peptide (residues 1083–1102) interacted with CDUb with a KD of 2.6 µM, but showed no binding to the CD alone (Fig. 3d and Supplementary Figure 3c). This is analogous to what we found for Ubl45 (Fig. 3b) and in line with our NMR experiments where the tail did not show clear binding to CD alone (Fig. 2c) but was immobilized by CDUb. Our results are in line with previously published NMR data that showed that a linked Ub is necessary to induce rearrangement of the catalytic site38. The binding of ubiquitin to CD apparently facilitates binding of the C-terminal tail (Fig. 3d). Together, these data explain how CD can still be activated by the C-terminal tail on its own, albeit with a lower resulting activity than the FL construct36. We conclude that once the ubiquitin-bound intermediate state is achieved, the C-terminal tail is sufficient for self-activation. Knowing that the C-terminal tail has high affinity for CD only after ubiquitin binding (Fig. 3e), we wondered if Ubl45ΔC might affect the Ub binding. Such an outcome is consistent with our previous results indicating that in full-length USP7 self-activation increases the catalytic rate (kcat) but also the KM (which is, on a minimal substrate, dominated by the affinity to ubiquitin), from >>35 µM to roughly 4 µM31. It may also explain why direct linkage of the C-terminal peptide to the CD almost, but not completely recapitulates the full-length activity36. We therefore tested ubiquitin binding qualitatively in a fluorescence polarization (FP) assay, following polarisation of TAMRA-labelled Ub upon incubation with various USP7 constructs (Fig. 3f). In this assay, we see the increased affinity for ubiquitin in the presence of the Ubl45 domain (when comparing CD12345 with CD only) even when the tail is absent (comparing CD12345ΔC to CD). The data indicate that the presence of the C-terminal tail does not affect the CD affinity for Ub, in line with its lack of affinity for CD observed in the NMR (Fig. 2b) and SPR experiments (Fig. 3d). We could confirm the Ubl45-induced increase in affinity of CD for Ub by analysis of the steady-state kinetics of these constructs in activity assays (Fig. 3g). When we fit Michaelis-Menten curves for CD, CD12345 and CD12345ΔC we could see that presence of the C-terminal tail dramatically increases kcat31; whereas, the Ubl45ΔC is responsible for the increase in KM (compare CD and CD12345ΔC in Fig. 3g). These data suggest that USP7 is likely to follow a multi-step mechanism during its catalytic cycle. In the first step, binding of ubiquitin is facilitated by the core of Ubl45, which does not involve the C-terminal tail. After binding of ubiquitin, conformational changes align the catalytic triad33. In this state, the affinity of the CD for Ubl45 is decreased (Fig. 3e), but the affinity for the tail is dramatically increased, allowing optimal orientation of the activating C-terminal tail to form the activated state. This mechanism is reminiscent of the classical-induced fit in enzymology, where binding of the substrate can activate the enzyme: here, ubiquitin-induced binding of the C-terminal peptide stabilizes the active CD conformation and promotes fast hydrolysis of substrate, which is observed as an increase in kcat. Next, we wanted to address the role of the target protein in the USP7 mechanism. To study whether interactions with a ubiquitinated target protein would affect USP7 activation we make use of a chemical biology approach. We chose p53 as our model target protein (Fig. 4a), which has six lysines near the C-terminus that can be ubiquitinated39 as well as motifs that can be recognized by the USP7 TRAF domain29,43. 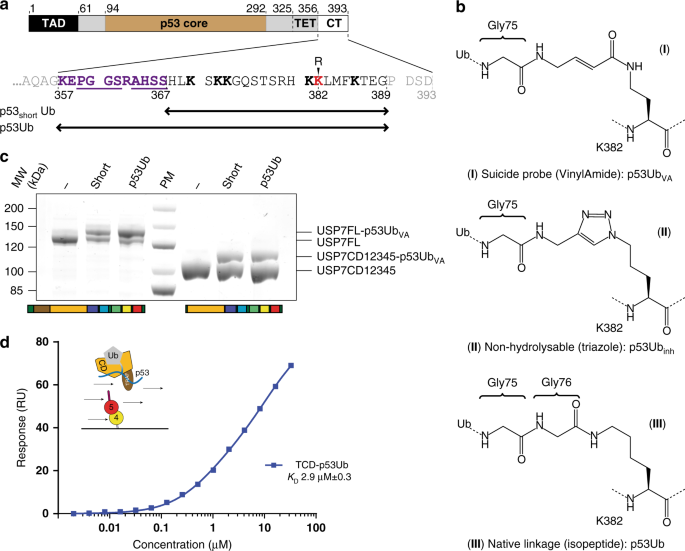 We made a synthetic toolbox of ubiquitinated C-terminal p53 peptides44 and initial tests on these conjugates indicated that all six lysines could be cleaved by USP7. We generated two versions of the ubiquitinated p53 peptides with K382 as the ubiquitination site, either with the TRAF recognition motif (p53Ub, res. 357–389) or without this region (p53shortUb, res. 368–389, Fig. 4a). The ubiquitin attachment was varied to allow different assays: a suicide version with a vinylamide (VA) linkage (I)45 that can bind covalently, like the better-known vinyl methyl ester46,47, a non-hydrolysable triazole linkage (II)48 and a cleavable native isopeptide linkage (III)44,49, for both the short and long versions of the peptide (Fig. 4b). Using the p53UbVA suicide probes, we were able to assess the role of the TRAF interaction in substrate binding. Although both short and long versions of the probe reacted readily with CD12345 (Fig. 4c, Supplementary Figure 4), the full-length USP7, which contains the TRAF domain, showed increased complex formation, specifically for the p53Ub peptide that has the TRAF recognition sequence. This indicates that the TRAF recognition sequence promotes the USP7 interaction with the model substrate. In the remainder of this report we will focus on the long peptide. Next, we used the p53UbVA probe to generate a non-hydrolysable complex with TCD, a construct that lacks all Ubl domains (Fig. 1a) to address whether the p53 interaction affects the interaction of CD with Ubl45. Using SPR, the complex was flowed over immobilised Ubl45 and we could determine the affinity between Ubl45 and TCD-p53Ub (Fig. 4d, Supplementary Figure 3d). With a KD of 2.9 µM it is similar to the affinity found for the C-terminal tail interacting with CDUb (2.6 µM, Fig. 3d). Apparently the presence of the TRAF-p53 interaction does not further change the interaction with Ubl45. This is in line with the fact that the presence of the TRAF domain does not affect activity on a minimal substrate31 or the association of the activating Ubl45 domain. To further investigate the role of the p53 peptide interaction with the TRAF domain in the activation process, we decided to look at the affinity between USP7 and the model target. As previous reports have alluded to an additional binding site (other than TRAF) for the USP7 targets p53 and MDM2 in the C-terminal domains of USP750, we first assessed the binding of the peptide to USP7 constructs in a FP assay (Fig. 5a). These direct binding assays with TAMRAp53 peptide confirmed the presence of an additional p53 binding site and map it to the Ubl45 domains, without requiring the C-terminal tail (compare FLΔC and TCD45 to TCD). Interestingly, this additional interaction site depends on the TRAF domain since CD12345 alone does not bind the peptide at these concentrations (Fig. 5a). These results suggest an extended binding interface between the TRAF-CD and the p53 peptide that is aided by Ubl45, but the hypothesis of a second, very weak, binding site within Ubl45 cannot be excluded. To then assess a potential increase in affinity for the ubiquitinated substrate, we used the non-hydrolysable compound (Fig. 4b; p53Ubinh) as inhibitor in an activity assay, on minimal substrate UbRho (Fig. 5b). We found that both the TRAF domain (compare TCD and CD) as well as Ubl12345 improve the IC50 independently (Fig. 5c). However, the full-length construct displays a further avidity effect, resulting in an IC50 of 16 nM, ~60-fold better than either TCD or CD12345. This underlines that the TRAF domain, CD and Ubl12345 all contribute to the effective substrate (p53Ub) recognition and that the sum of these interactions yields a tight, effective interaction. 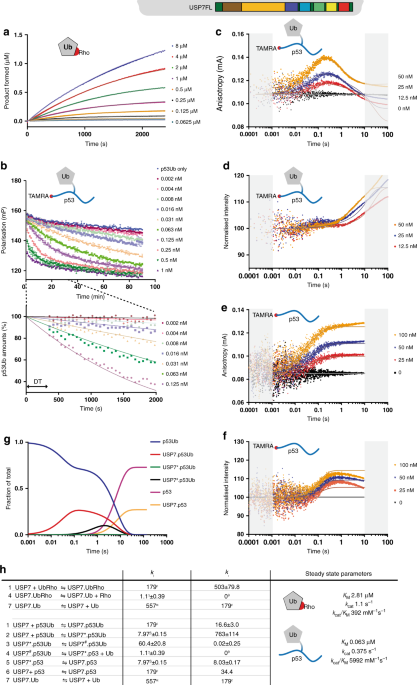 As both the ubiquitin acceptance (aided by Ubl45) and the target recognition positively influence deubiquitination, we wanted to explore how these collaborate during the deubiquitination process and whether there is a defined order of events. To this end, we utilised the synthetic ubiquitinated p53 target with a native linkage (Fig. 4b; p53Ub) and a fluorophore at the N-terminus of the p53 peptide to allow tracking of substrate and product44. We monitored the substrate during its hydrolysis in an FP assay where 100 nM of TAMRA-labelled reagent is incubated with various USP7 constructs (Fig. 6b for FL, Supplementary Figure 5–7b for TCD, CD12345 and CD). Both FL and CD12345 could readily hydrolyse the substrate, resulting in a drop of the FP signal. The other two constructs, CD and TCD, required higher concentrations in order to see a decrease in FP signal, while the TCD construct actually started out with an increased signal (Supplementary Figure 5b). This increased signal would be a result of binding, as the TRAF domain increases the affinity for the p53-substrate, but the rate of catalysis is still low for TCD. Although these experiments efficiently monitored substrate hydrolysis, we were interested in the early events that could not be caught in our plate reader setup. To get insight into the very early phase of the reaction, we decided to use a stopped-flow setup (Fig. 6c, d). We followed the reaction by fluorescence polarization, which is sensitive to the size of the complex (as this affects the tumbling rate and thus polarisation), and by fluorescence intensity, which responds to changes in local conformation affecting the fluorophore. As these experiments were performed under near-equimolar amounts of enzyme and substrate, we also measured binding to the product TAMRAp53 peptide in this stopped-flow setup (Fig. 6e, f). In the stopped-flow anisotropy data, we could detect an increase in signal when we titrated FL into TAMRAp53Ub (Fig. 6c). After this binding phase (0.02–0.2 s) we observe a decrease in anisotropy, indicating a second phase (0.2–2 s) indicative of hydrolysis. The signal however does not drop below baseline for the highest concentration, indicating retention of the product, in line with our p53 peptide binding data (Fig. 6e). For the constructs CD and CD12345 we can hardly detect the TAMRAp53Ub binding phase (Supplementary Figure 6, 7) or the decrease in anisotropy, indicating that these require the presence of the TRAF domain. When TRAF is present, in TCD, both binding (increase in anisotropy) and hydrolysis (decrease in anisotropy) are visible (Supplementary Figure 5c), but the decrease only occurs after a lag phase (>5 s), indicating the presence of intermediate states between binding and hydrolysis. This step is more explicitly visualised in the intensity data from these stopped-flow experiments. For TCD (Supplementary Figure 5), with the long delay between binding and hydrolysis, we see a significant decrease in intensity in this delay (Supplementary Figure 5d), which we interpret as a conformational change in the protein (see Supplementary methods). For full-length USP7 a minor intensity increase (Fig. 6d) occurs, with a slight delay (0.05–0.5 s) relative to the binding phase. This suggests that a further conformational change affects the intensity signal, which we interpret as binding of the C-terminal tail, read out by rearrangement of the TAMRA label. The non-synchronicity of the events in the anisotropy and intensity experiments suggests that multiple steps are involved in the hydrolysis mechanism. To model these multiple steps we describe every phase, with as few reaction steps as possible. We imported the raw stopped-flow, FP and activity data into KinTek51 and scaled the data based on the negative controls (Supplementary methods). This rendered the data interpretable by KinTek modelling with a minimal set of reaction equations. To be able to model the non-synchronous changes in the FP and intensity signals we introduced intermediate steps in the reaction (Fig. 6h). These include binding events (Steps 1, 6 and 7), conformational changes (Steps 2, 3 and 5) and the enzymatic hydrolysis (Step 4). The introduction of these steps allowed a good fit to the data and made it possible to derive rate constants (kf and kr) for every step of the mechanism (Fig. 6h). For the shorter constructs, introduction of one intermediate step between the binding (Step 1) and the hydrolysis step (Step 4, Supplementary Figure 5, 6, 7) was sufficient to fit the experimental traces. For the full-length construct however a second intermediate step was necessary to match the model to the experimental data. The order of release of the reaction products p53 and Ub could not be determined based on activity data alone. Therefore, we used their respective affinities (Fig. 3f, 5a) to set the order of release. This order, with later release of the p53 peptide, also allowed adding affinity data for the secondary binding site to the model, as induced by Ubl45 (Fig. 5a), which fitted well in the stopped-flow data (Fig. 6e, f). The modelling of the experimental curves allowed us to tease apart the various steps that USP7 performs in catalysis and reveals how the different domains affect the target processing. For instance, the intensity decrease observed upon p53Ub binding by the TCD construct (Supplementary Figure 5d) is not seen for FL (Fig. 6d). We can interpret this absence as an effect of the ‘folding back’ of the Ubl domains towards the CD31 and changing the p53 interaction50. Likewise, the long delay time, seen for TCD, is much shorter for constructs that still contain the Ubl domains. As these domains activate CD, it seems reasonable to assume the delay time in TCD is required to remodel the catalytic site into an active conformation33 without help of the Ubl domains. The KinTek analysis results in a model where we can quantify each component (Fig. 6g) and reaction kinetics (Fig. 6h). In the first step, anisotropy changes are interpreted as binding of substrate p53Ub (Step 1; Fig. 6h). This is followed by multiple changes in intensity which are interpreted as conformational changes (Steps 2 and 3). Next, the intensity rises and the anisotropy decreases (Step 4), interpreted as hydrolysis and release of the ubiquitin product. Further intensity changes (Step 5) take place before p53 peptide release returns USP7 to the ground state (Step 6). Our kinetic model fully agrees with the order of events observed in NMR and SPR analysis in Figs. 2–3. We decided to test whether this could be used quantitatively as an independent control. We applied the model to fit the analysis of the minimal substrate, UbRho (Fig. 6a, Supplementary Figure 5a, 6a, 7a). Besides validating the kinetic model, this would also allow better definition of the rate constants by co-refining the values within KinTek. The intermediate states were used in the fitting, making a direct comparison between the ubiquitinated target protein and the minimal substrate possible. For the FL construct the efficiency of the reaction precluded fitting the intermediate steps in the minimal substrate analysis, so we only used steps 1, 4 and 7 (Fig. 6h). The validity of the fitted constants was then analysed using the FitSpace module of KinTek52. Here we found that only TCD and FL data had sufficient amplitudes to allow for a full statistical analysis (Supplementary Figure 8). To avoid overfitting within this analysis, we linked rate constants (Supplementary Figure 8a,d), testing the statistical relevance for their ratios rather than their absolute values. The overall result indicated a well-constrained model where Step 2, the catalytic rearrangement, is the rate-limiting step. Finally, we converted the rate constants into steady-state kinetics parameters using the appropriate formula for one (Supplementary Figure 8f) or two (Supplementary Figure 8c) intermediates53 (Supplementary Figure 5g, 6f, Fig. 6h). This yielded KM and kcat values for all steps. The values for the minimal substrate are similar to those determined previously31, validating the descriptions used in our modelling. The conversion to steady-state parameters allows for easy comparison of USP7 activity on minimal substrate and the p53 model substrate. The combined increased activity (kcat/KM) is ~11,000-fold, for FL on p53Ub relative to CD on UbRho. Interestingly, on the p53Ub substrate kcat is slightly diminished as soon as a TRAF domain is present, but this is offset by the improved target recognition (here expressed as KM) leading to substantially increased processivity. These findings indicate that, although studies on a minimal substrate are essential in studying the enzymatic mechanism, using a realistic substrate can give better understanding of the working of a DUB and its possible regulation.